After unveiling her Madame Tussaud's wax figure to the local media last March 28, Pia Wurtzbach said she was just as impressed as everyone when she first saw her immortalized image. The wax figure of Pia has her wearing a blue Michael Cinco gown while posed to crown her successor in Miss Universe. "Yung Madame Tussaud's yung namili ng pose at ng gown at nung moment and actually wala rin akong maisip na better pa na pose kasi very interactive siya for anyone who's going to see her. They can be crowned as a Miss Universe di ba? Amazing talaga. Sobrang galing nila. Yung sa hair naman, lumabas kami sa natural light, kasi iba pala yung color ng hair natin sa harap, sa likod, sa ilalim, so lahat yun tiningnan nila and then pati yung color ng mata ko tiningnan sa natural light tapos kinuha talaga yung exact color. Yung sa teeth naman kinuha nila yung dental impression ko sa dentist ko so sobrang sakto talaga siya," she shared. The wax figure, which was worked on by 20 artists abroad, was also a labor of love for Pia. "It takes some time to make it look really realistic and it took a few hours of measurements to get it really right but hindi ako napagod. I didn't get tired or anything. My adrenaline was up. I was too excited. I really prepared for that moment as well," she recalled. The World of Dance host said she even had to hold the same pose for four hours just to get everything in her likeness. "So they measured everything manually. I stayed in the pose for a few hours but it was fine, no problem. Okay lang. And I remembered when they asked me to do the smile I was thinking, 'Okay, this has to be my best smile because hindi na mababago ito. Yung smile ko na ito, yun na yun!' They got everything right, the color of my hair, the color of my eyes. They even got my dental impression from my dentist. And if you see it, makikita mo parang may veins pa siya. Ang galing talaga, super," she said. Aside from World of Dance, Pia said she is also busy with her new travel show called Pia's Postcards. She also has an exciting movie project in the works with a brand new leading man. "Tomorrow night we're going to fly to Korea so yun yung next destination namin and we have World of Dance also malapit na rin yung finals niyan. And mag-sa-storycon na rin kami with Blacksheep. I'm really excited about that also. 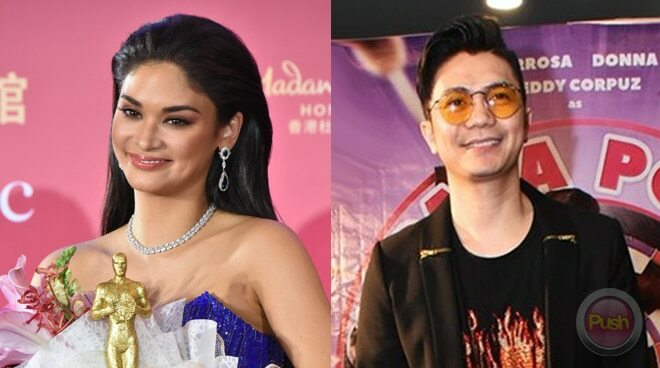 Kasama ko sa movie si Vhong Navarro," she said.